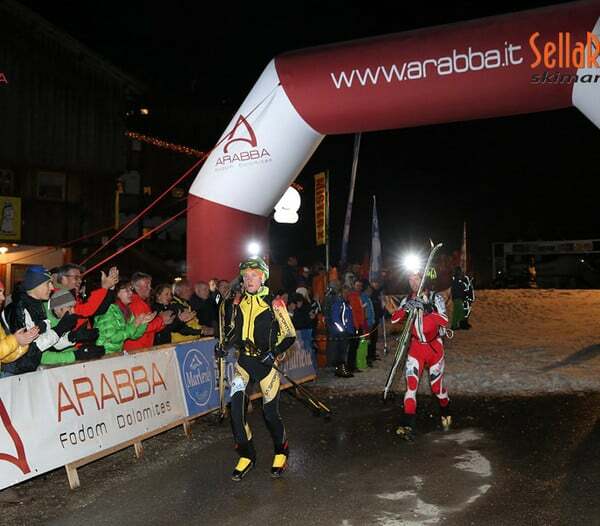 Home page Arabba News The 23rd edition of the Sellaronda Skimarathon starts tomorrow! The 23rd edition of the Sellaronda Skimarathon starts tomorrow! Just a few hours to go until the 23rd edition of the Sellaronda hits off. 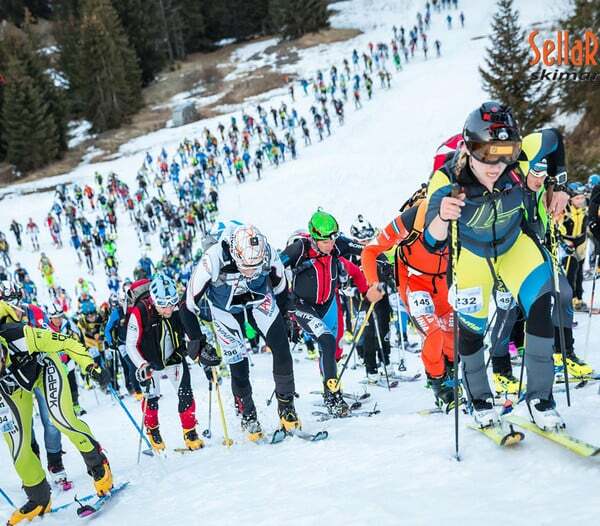 Tomorrow afternoon at 6pm the 650 teams for a total of 1300 Sellaronda athletes will set off from the centre of Canazei. The evening’s menu consists of: 4 Dolomite passes, Sella, Gardena, Campolongo and Pordoi,42 kilometres and 2700 metres of vertical height gain. Sellaronda represents the night time ski-mountaineering race par excellence, racing through the night, lit up by head lamps. The itinerary which is 42 kilometres long and has 2700 metres of vertical height gain takes place in the Dolomiti Superski resort, the largest in the world and runs along the famous slopes which embrace the Sella group. Canazei will welcome the racers already by late morning, when they will collect their race bib at the Village, which has by now become a tradition. After the start, the athletes will start to climb up towards Lupo Bianco to tackle the fearsome dolomite passes, Sella, Gardena, Campolongo and Pordoi. The athletes will pass by Lupo Bianco at 6.25 pm while athletes at the tail end will transit at approximately 6.35 pm. At Passo Sella/Rif. Salei the head of the group will pass by at 6.40 pm (7.20pm for the last athletes). The passage through Selva di Val Gardena-Wolkenstein will be at roughly 6.50pm (7.40 for the last athletes). At 7.30 pm the shut off gate. On Passo Gardena/Dantercepies the head of the race will climb over the pass at 7.25 pm while the last athletes will start to ski down towards 8.50pm. The athletes will pass through Corvara/Alta Badia where the half way mark is at approximately 7.30 pm. The shut off gate will close at 8.55. The road crossing at Passo Campolongo will be at 7.55 pm, and at 10pm for the last athletes. At Bec de Roces the leaders will pass by 8.15pm, while they will pass through Arabba/Fodom about 5 minutes later, at 8.20pm. The time limit at Arabba has been fixed for 10.25 pm. Climbing towards Passo Pordoi at 8.35pm the athletes will pass by Pont de Vauz. The time limit is for 11 pm. The last pass, Pordoi, will be conquered at 9pm, while the finish at Canazei, depending on the record being broken, will be at 9.05pm. The last athlete is planned to arrive half past midnight. The German athlete Anton Palzer, who was going to race together with the Swiss Remi Bonnet has dropped out of the race due to the flu. In 2015 Palzer, a Red Bull team athlete, together with the Italian athlete Damiano Lenzi, broke the course’s record with the time of: 03:04’40”. The Swiss team made up by Martin Anthamatten and Werner Marti will set off with the clear aim of winning the race. Unfortunately it has been confirmed, after a “last minute” communication through social media, that Pietro Lanfranchi together with William Boffelli, will also drop out due to a small injury. The team of Filippo Barazzuol and Alexis Sévennec is confirmed. Barazzuol, winner of the 2017 edition of the Sellaronda Skimarathon 2017, will wear the number one race bib. Among possible outsiders we have Martin Stofner with Federico Nicolini and Manfred Reichegger with the very young Davide Magnini. For the female race: Vittoria Kreuzer, last year’s winner (she won with Martina Valmassoi) will race with Severine Post Combe. Alba De Silvestro the Dynafit ambassadress will be on the start line, the athlete from Belluno will race with Jennifer Fiechter. The female record to beat is 3:52’05’ set by Corinna Ghirardi and Francesca Martinelli in 2015. Even the team commentating the race live is ready, Canazei will have Giorgio Pedron and Serena Rasa, while the head of the race will be followed by Carlo Ceola and the female race will be commentated by Omar Oprandi. Francesco Erioldi will be live from Arabba. Follow the race live on the website page www.sellaronda.it it will start at 7.20 pm.